Edward M. House. Image available on the Internet and included in accordance with Title 17 U.S.C. Section 107. HOUSE, EDWARD MANDELL (1858–1938). Edward Mandell House was born in Houston on July 26, 1858, the last of seven children of Mary Elizabeth (Shearn) and Thomas William House. His father was one of the leading citizens of Texas, a wealthy merchant, banker, and landowner. Edward had a privileged youth: he spent six months in England in 1866, met many prominent people who visited the large family homes in Galveston and Houston, and enjoyed the colorful life of his father's sugar plantation near Arcola Junction. As a boy he rode and hunted, admired the gunfighters of the era, and roamed the flat, vast coastal plain near Houston. Initially House attended Houston Academy, but after the death of his mother on January 28, 1870, his father sent him to boarding school, first in Virginia and then in New Haven, Connecticut. House was not a serious student, and he and his closest friend, Oliver T. Morton (the son of Senator Oliver Perry Morton of Indiana), became absorbed in the Hayes-Tilden election of 1876 and the long crisis following it; they frequently traveled to New York and Washington. Edward M. House Mansion in Austin. Courtesy of the Austin History Center, Austin Public Library and Humanities Texas. Image available on the Internet and included in accordance with Title 17 U.S.C. Section 107. Residence of Edward M. House in Austin (1920). Courtesy of the Casey M. Weaver Collection. Image available on the Internet and included in accordance with Title 17 U.S.C. Section 107. In the autumn of 1877 House entered Cornell University, where he remained until the beginning of his third year, when his father became ill and the younger House left school to care for him. When T. W. House died, on January 17, 1880, his son decided to stay in Texas and help manage the estate, which was to be divided among the five surviving children. On August 4, 1881, House married Loulie Hunter of Hunter, Texas. After a year in Europe the couple returned to Houston, and House supervised the family's extensive landholdings scattered throughout Texas. In the autumn of 1885 he moved to Austin in order to escape the heat of Houston and to be closer to his cotton plantations. 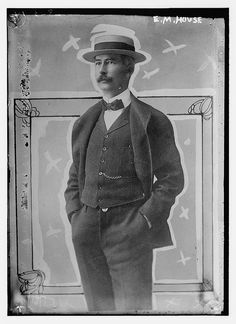 He became a prominent member of Austin society and, in the late 1880s and early 1890s, pursued a variety of business activities, including farming and land speculation. In June 1892 he completed a great mansion at 1704 West Avenue, designed by the New York architect Frank Freeman. The house was one of the finest examples in Texas of the Shingle style of residential architecture. With a minimum of decorative detail, it made innovative use of red sandstone, sweeping shingled roofs, and an open-plan interior in a style that suggested future architectural trends. It was razed in 1967. House was drawn into state politics through his friendship with James Stephen Hogg, who in 1892 faced a formidable challenge for renomination and reelection from conservative Democrats and Populists. House directed Hogg's campaign, established a network of contacts with influential local Democratic leaders, manipulated the electoral machinery, and bargained for the votes of African and Mexican Americans. Hogg triumphed in a bitter, three-way race and rewarded House on July 20, 1893, with the honorary title of "lieutenant colonel." The press soon shortened the title to "colonel." Fascinated more with the process of politics than with the substance, House proceeded to build his own faction-"our crowd," as he called it-which became a powerful force in Texas politics. He was an ambitious political operator, skilled in organizing and inspiring others. He worked largely behind the scenes, developing ties of loyalty and affection with his close associates and using patronage to rally party workers behind his candidates. From 1894 to 1906 House's protégés served as governors of Texas. He and his associates managed the gubernatorial campaigns of Charles Allen Culberson, Joseph D. Sayers, and Samuel W. T. Lanham. House was especially close to Culberson, whose elevation to the United States Senate in 1898 the colonel directed. House served as a political counselor, often dispensing advice and controlling patronage for all three governors. 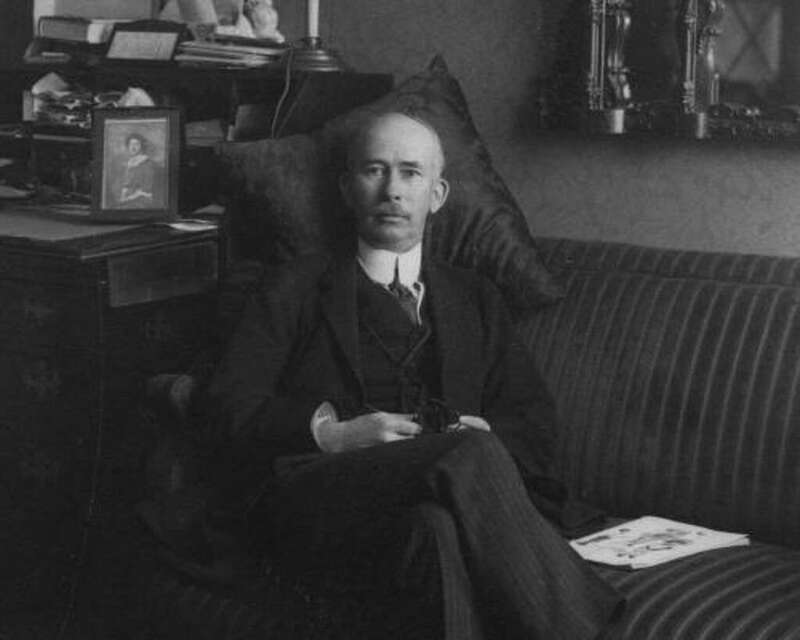 Edward M. House at His Apartment in New York. Courtesy of the Houston Chronicle. Image available on the Internet and included in accordance with Title 17 U.S.C. Section 107. By the turn of the century he was bored with his role in Texas politics and was restlessly searching for broader horizons. He sought further wealth, first by attempting to profit from the discovery of oil at the Spindletop oilfield in 1901 and 1902. With the backing of eastern financiers, he formed the Trinity and Brazos Valley Railway Company. He also felt the pull of the East. For years he had spent the summers on Boston's North Shore, and gradually he began to winter in New York, severing most of his ties with Texas and only occasionally visiting the state. After 1904 he was never again involved in a gubernatorial campaign. President Woodrow Wilson and Edward M. House (1915). Image available on the Internet and included in accordance with Title 17 U.S.C. Section 107. As a youth House had dreamed great dreams, yearning for a place on the national political stage. A conservative, sound-money Democrat, he disliked William Jennings Bryan and in 1904 supported Alton B. Parker. Discouraged by the prospects of the Democratic party after Parker's defeat in 1904 and Bryan's in 1908, House found solace in leisurely tours of Europe and in spiritualism. He continued his search for a Democratic presidential candidate, and on November 25, 1911, met Woodrow Wilson; the two formed a close friendship that lasted for years. House participated in Wilson's campaign for the presidential nomination by using his influence to secure the forty votes of the Texas delegation and the approval of William Jennings Bryan for Wilson's candidacy. After Wilson's victory House refused any official appointment, but was responsible for the appointment of several Texans to cabinet positions. He quickly established himself as the president's trusted adviser and confidant, especially on foreign affairs. American Delegation at Versailles Peace Conference (1919). Courtesy of Getty Images. Image available on the Internet and included in accordance with Title 17 U.S.C. Section 107. After the outbreak of World War I, House undertook several important European missions for the president. When the United States became involved in the war, he won British and French acceptance of Wilson's Fourteen Points as the basis for the peace. House was appointed one of the five American commissioners at the peace conference and served as Wilson's second in command. When the president temporarily returned to the United States during the negotiations, House took his place at the head of the American delegation. After signing the Treaty of Versailles on June 28, 1919, Wilson appointed House to represent him at London in the drafting of provisions for operation of the mandate system set up by the treaty. President Franklin D. Roosevelt and Edward M. House. Courtesy of Getty Images. Image available on the Internet and included in accordance with Title 17 U.S.C. Section 107. Grave of Edward M. House. Courtesy of Robert Hague and Find-a-Grave. Image available on the Internet and included in accordance with Title 17 U.S.C. Section 107. The relationship between the two men deteriorated after Wilson was incapacitated by a stroke in the fall of 1919, and during the Republican party's ascendancy in the 1920s House ceased to exercise direct influence on public affairs. Until his death, however, he maintained close contact with important national and international figures. He took an interest in Franklin D. Roosevelt's nomination in 1932, but made no effort to resume the political influence he enjoyed under Wilson. House died on March 28, 1938, in New York City and was buried at Glenwood Cemetery in Houston. Drury Blakeley Alexander and (photographs) Todd Webb, Texas Homes of the Nineteenth Century (Austin: University of Texas Press, 1966). Alexander L. and Juliette L. George, Woodrow Wilson and Colonel House (New York: Dover, 1956). Charles E. Neu, Colonel House: A Biography of Woodrow Wilson's Silent Partner (New York: Oxford Press, 2015). 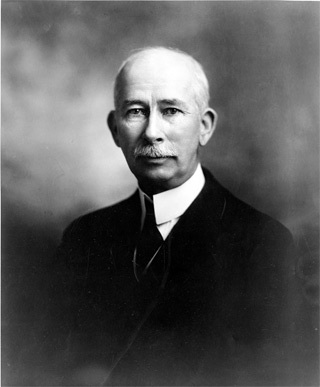 Rupert N. Richardson, Colonel Edward M. House: The Texas Years, 1858–1912 (Abilene, Texas: Hardin-Simmons University, 1964). Handbook of Texas Online, Charles E. Neu, "HOUSE, EDWARD MANDELL," accessed April 24, 2019, http://www.tshaonline.org/handbook/online/articles/fho66. Uploaded on June 15, 2010. Modified on February 22, 2017. Published by the Texas State Historical Association.